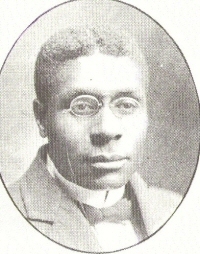 John T. Gayton, one of Seattle, Washington’s earliest black residents, a community leader, and patriarch of one of the city’s most outstanding black families, came to Seattle in 1889. He was born in Benton, Mississippi to former slaves. With little formal education, he moved to Yazoo City, Mississippi, and made the fortuitous decision to work for a physician, Dr. Henry Yandell, as servant and coachman. It brought him to Seattle when Dr. Yandell joined the movement to the new state of Washington. Soon after his arrival in Seattle he tried his hand as painter, painting contractor, barber, and bellboy. He worked as a waiter at the Arctic Club and later at the Rainier Club, where he was promoted to headwaiter. In 1901 he became the first black steward at the Rainier Club, overseeing the servants and the preparation of food. Before long, he was called upon to cater large parties and banquets. He also catered everyday for a downtown restaurant. Gayton studied bookkeeping at Wilson’s Modern Business School while working as a waiter and he studied law while working as a steward. He never took the bar examination but his background eventually served him well for in 1904 he began working for the new U.S. District Court as a messenger and bailiff. In August 1933, President Franklin D. Roosevelt appointed him U.S. District Court Librarian. Because of Gayton’s broad experience with the court system and his knowledge of the library, young lawyers often called upon him for advice, as did immigrants seeking help in studying for citizenship exams. John Gayton served in this position for 20 years. Historylink.org Online Encyclopedia of Washington State “John T. Gayton” (by Mary T. Henry) http://www.historylink.org/ accessed January 25, 1999-updated September 2005.